Seek out Ricky in Silver Knight's Town. He will tell you about a Black Knight Pledge Document which proves their loyalty to the Pretender King. He asks you to bring him back one of these documents, as it contains the Black Knights' secret mission plans. 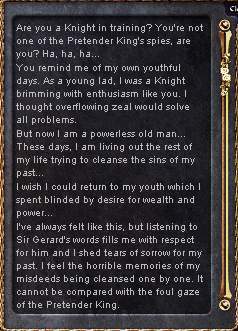 Go to the forest north of town, and kill Black Knight parties until one of them drops you a pledge document. Return this to Ricky and he will reward you with a Knight Hood. Now, slay more Black Knights until you find an Old Trading Document. Head to Heine Dungeon, and go to the fourth floor (underwater). Hunt Turtle Dragons until one drops a Turtle Dragon Shell. Bring the Knight Hood, the Turtle Dragon Shell, and the Old Trading Document to Aanon in Silver Knight Town and he will create a Red Knight Hood (-2 AC Base, 20 Weight). This hood is safely enchantable to +6. Qwazin: Black Knight Pledge Document, Old Trading Document, and the Turtle Dragon Shell can be obtained more than once and cannot be dropped or traded. Players can, however, sell them to NPC merchants in each town in exchange for a small amount of adena.